Sony Ericsson has joined the mobile Internet hardware game by premiering two of its first High Speed Packet Access ExpressCard/34 devices at 3GSM in Barcelona this week. The EC400 and EC400g, both offer triple band HSPA/UMTS 850/1900/2100 MHz, and quad band EDGE/GPRS 850/900/1800/1900 connectivity where HSPA and UMTS are not available. HSPA downlink reaches speeds of up to 7.2 megabits per second (Mbps), and uplink, speeds of 2.0 Mbps. EC400g comes with a built-in GPS receiver, which automatically shows the user's global position in location-based services such as Google Maps. Both items are automatically installed and configured and feature Sony Ericsson's Wireless Manager. The devices protrude only slightly when in place, for the second antenna's housing, the main antenna is built into the body of the unit. 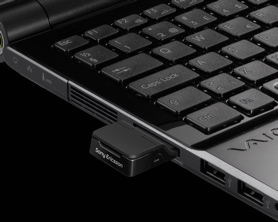 Sony Ericsson has announced that the EC400 and EC400g ExpressCards will be available in mid-2008. 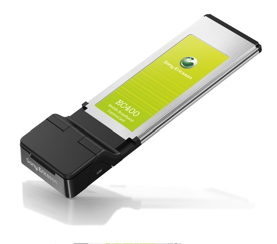 In the United States, the Mobile Internet ExpressCard market is dominated by Novatel, which supplies Sprint and Verizon Wireless with hardware.